How did i use 8 out of 10 ssl submissions? I am not using ssl submissions on my forms, how my account reach 8 out of 10? I was not able to see any JotForm from visitors area. The JotForms may have been embeeded in Member's area which I was unable to access due to password protection. 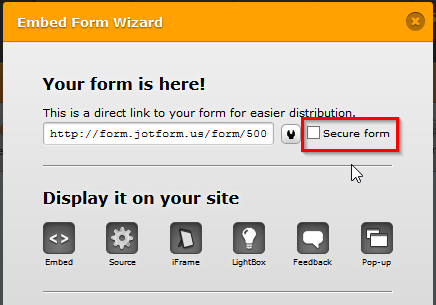 You should be receiving SSL submissions when the JotForm is embedded by checking Secure Form option from Embed Form wizard. You may uncheck this option and make sure that the URL starts with http only (Not https). After un-checking this option, you'll need to re-embed the JotForm on your website. Hope this information helps. Please let us know if we can be any further help.